ALTO, Ga. -- Graduating high school guarantees little. It does not guarantee a better job, nor a better life -- just a much better chance. But for 19 women who received their diplomas Thursday, it meant a historic step. They formed the first group of Georgia inmates to graduate high school while in a state prison -- in this case, Lee Arrendale State Prison in Gainesville. Most states allow inmates to receive GEDs. Georgia is now one of the few that goes further, using charter school provisions to enable its inmates to graduate high school. GAINESVILLE, Ga. -- Gainesville Police are reassuring the public there is no cause for alarm after an accidental shooting at an Armed Forces Recruiting Center. It happened at around 10:30 a.m. Friday in the McEvers Corners Shopping Center at Dawsonville Highway and McEver Road. Police said an armed forces member was shot. The victim was taken to Northeast Georgia Medical Center for treatment. Gainesville Police spokesman Kevin Holbrook said it appears the victim shot himself. "Given recent incidents in Chattanooga we know the public may be concerned about the police presence," the police department said on its Facebook page. "There is no need for public alarm, this was an accidental shooting. FORSYTH COUNTY, Ga. -- Forsyth County Sheriff's investigators believe a man found dead over the weekend was committing a burglary shortly before he passed away. Officials were dispatched to the 8200 block of Browns Bridge Road Saturday at around 7 a.m. When they arrived, they found 42-year-old Joseph Pollard dead. Investigators said Pollard and 51-year-old Jeffery Chester were burglarizing the location when Pollard died. Chester left, then later returned to the scene. He was arrested and charged with burglary. Pollard's cause of death has not been determined, but police do not suspect foul play. The GBI will perform an autopsy. 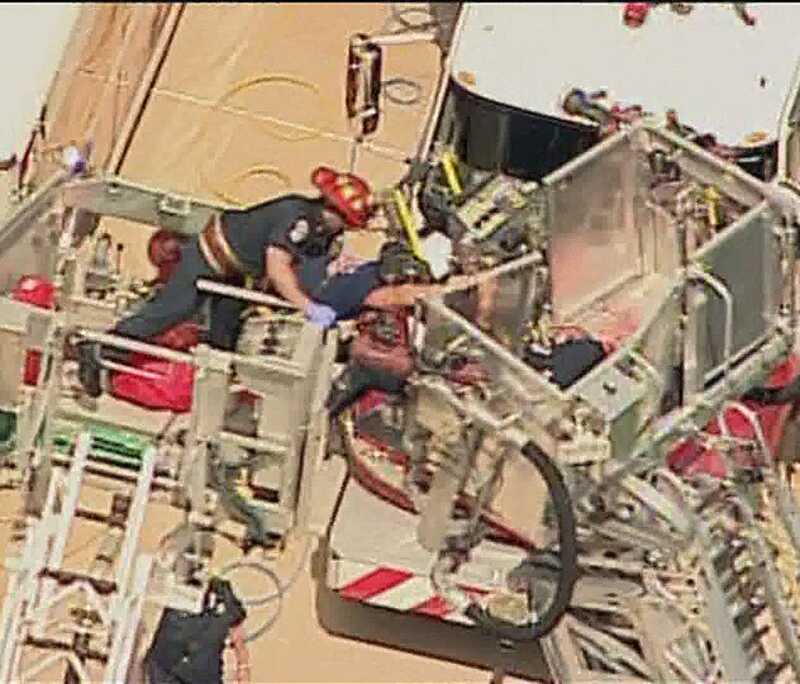 GAINESVILLE, Ga. -- The three Hall County firefighters injured last July after their ladder truck collapsed are now suing the truck's manufacturer. The firefighters -- T.J. Elliott, Will Griffin, and Stephen Jackson -- fell 45 feet last year during a training exercise. But attorney Shane Lazenby, representing Elliott, would tell you the story begins three months earlier, when Hall County purchased the truck from the Sutphen Corporation for more than 500,000 dollars. Lazenby says Sutphen did not fully disclose the truck's issues to Hall County. HALL COUNTY, Ga. -- One person was shot at Georgia State Patrol Post Six in Hall County Monday morning. The Georgia Bureau of Investigation said 21-year-old Leighton Beaux Marchetta drove up to the building at around 8 a.m. He was armed with a .30-06 Ruger hunting rifle. Marchetta got out of his truck and yelled to two troopers standing outside, saying something like, "You guys are going to have to kill me," according to the GBI. Marchetta approached the troopers, who took cover. He fired a shot and ignored a trooper who told him to drop the weapon. GAINESVILLE, Ga. (WXIA) – Gainesville Police are looking for help from the public in finding an alleged police impersonator. On May 23, shortly after 11:30 pm, a woman was approached by a white man in an apartment complex off McEver Road. The suspect presented a gold badge to the woman and claimed to be a federal agent. Investigators said the suspect then asked to pat down the woman. "Once he was frisking her he began to touch her inappropriately," said Cpl. Kevin Holbrook. The victim was able to get away. GAINESVILLE, Ga. -- A man has been indicted after police said he misrepresented himself as a doctor and sexually assaulted a victim. Gainesville Police said that they first received a report of a sexual assault on March 26 when they were called to Northeast Georgia Medical Center where the victim went after the incident. According to the report, Jamieson L. Allen, 48, of Gainesville, Ga. allegedly encountered the victim and solicited the person for employment to move furniture at a residence. The report states that the two traveled to a residence in Gainesville where the job was supposed to take place. While at the residence, however, the report states Allen represented himself as a doctor conducting medical work. Allen had previously worked at Northeast Georgia Medical Center as a licensed nurse.